SIGNIFICANCE LIST: Not eaten. ; Poisonous to eat? KEY FEATURES: To 9cmSL. White with small yellow-brown spots, and with four dark brown saddles (including one on the head) separated by three white bars. 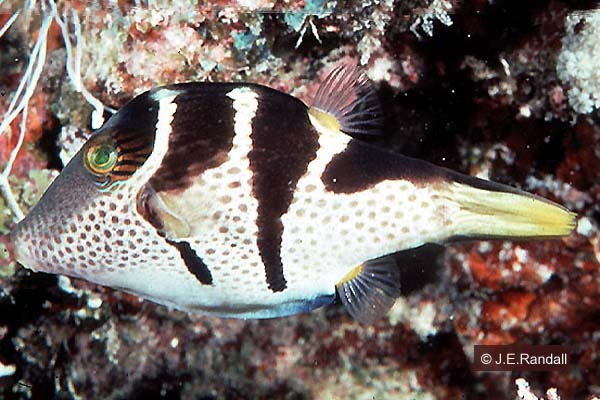 SIMILAR SPECIES: See under Crown Toby (Canthigaster coronata). Palmerston: Photo85 (G&S85). Pukapuka: informant reports at NBSAP meeting, 2/2004. Suwarrow: Photo85 (G&S85); photos pair in 8m lagoon ID N.Sims, confirmed J.E.Randall (Sims88).